15% OFF $20 OR MORE. Here’s a piece of trivia for you: Chris Barron, the lead singer for the band Spin Doctors, known for 1990s hits “Two Princes” and “Little Miss Can’t Be Wrong,” is obsessed with what kind of pie? If you guessed pecan pie, you got it! 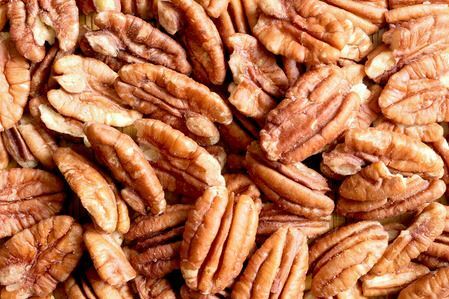 What is it about pecans that so many people love? Related to the walnut, pecans are pretty to look at, tasty and crunchy in your mouth, and nutritious in your body. They go well with caramel, ice cream, coffee cake and chocolate chip cookies. And best of all? Pecans contain more antioxidants than any other tree nut. You can look up the study in the Journal of Agricultural and Food Chemistry if you want to know more about that fact. Eating pecans can help reduce your risk of heart disease. A handful a day of pecans, a heart healthy food, is good for you, helping reduce your bad cholesterol while boosting your good cholesterol. They also improve digestion. Pecans are packed with fiber, which is good for your colon and bowel movements. Want to clean out your gastrointestinal system? Eat pecans. When you eat pecans you’ll feel full, quickly, so perhaps adding pecans to your daily diet can help you lose weight overall. They’re also full of vitamins which help increase your metabolism rate. Rich in magnesium, pecans are appreciated for their anti-inflammatory benefits. The oleic acid in them has been found to reduce the risk of breast cancer. Meanwhile, the manganese in them helps boost immunity while improving nerve conduction and your brain function. Finally, if you want to have better skin and are looking for foods that help with anti-aging, pecans are great for this– they’re loaded with vitamins A and E as well as zinc, folate and phosphorous. It has even been said eating pecans stimulates hair growth and prevents hair loss. My goodness, pecans have a lot of health benefits, don’t they? Kasza Sugar Bush offers coated pecans from our store in Shelby, Michigan. Imagine how tasty our maple glazed candied nuts taste– you’ve got to try them!